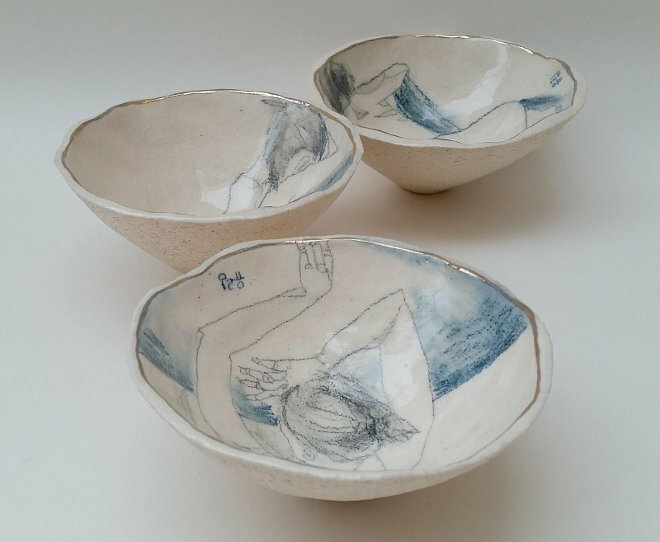 A while ago I wrote about the talents of life artist and ceramicist Yurim Gough. Her work still astounds me. If you haven’t yet laid eyes on it yourself, you might want to hot foot it to Victoria House, London WC1A 2QP. Yurim is showcasing the quiet resonance of her pieces at The Other Art Fair there until 10th April 2016. Recent works include this trio of hand shaped, stone-fired bowls, titled Hide and Seek. Each one shows a life model in the same pose, shown from a different perspective. I think they would make a wonderful #writingprompt too! Find details of The Other Art Fair here. This entry was posted in Inspiration and tagged art, ceramics, life drawing, The Other Art Fair, Yurim Gough by Judy. Bookmark the permalink.